Guess how I spent last weekend? You cannot understand how hard it was to get this shot as the ladieswere surrounded by other photographer so getting them pose for you. (I use the term Photographer here because most of the people there were carrying DSLR at the high-end range that it would scare away any GWC). I managed to get a lot of supposedly good shots but I made the old mistake of not checking those background! (SO REMEMBER CHECK THOSE BACKGROUND!) All those people walking by, the old granny, the tantrum throwing baby and the “giving the disapproving look” people who purposely stood behind the models to wreck our shots, some of the guys politely ask them to move aside but they refused saying we were doing “immoral” thing. My God why do we always encountered such people especially around Super GT season? Here is a test, which part of the photos are you looking at? It was a long wait, from 12pm till 3pm before they showed up, I heard they had to attend a press conference for the media. Still it was fun waiting ( NOT!). But I ain’t complaining! She is one hot lady! She definitely has the mature form between the 2, I wanted to get more shots of her but I was positioned on the side were Sana was standing while Nana was on the other and when it came for the closeups I only managed to get a good handful of shots as GWCs were trying to push me away with their dingy Point and shoots. Note to Self, get more shots of her at Auto-city. See what I mean? She’s got great form! Damn I need to get more shots of her! 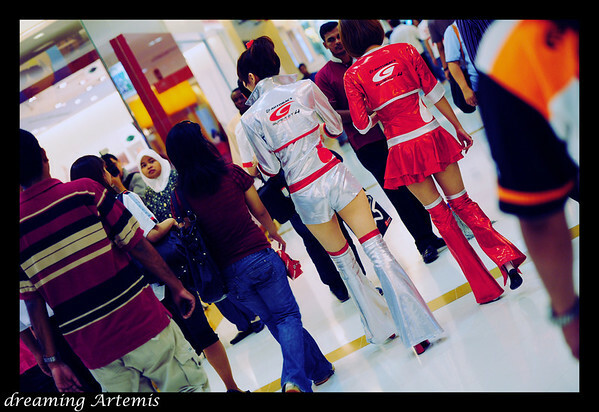 This entry was posted in femaleModels, KL, photography, PhotoReviews. Bookmark the permalink. Great job with the photos, keep it up! Nice shots, I wish I could’ve gone too. I appreciate comments and feedback but I will not tolerate spamming on the comment feature.